If you’re coming to RollerCon this year, you’ll be a part of a very cool happening. For the first time at an event of this size, three different versions of roller derby will be played during the weekend. For one glorious hour on Saturday, all three types will be played simultaneously on three separate tracks. Sweet! Though the overwhelming majority of games at RollerCon will be played under WFTDA rules,1 the weekend will feature more variety than ever before. The addition of the banked track means games played under RDCL rules, and a showcase game for USARS Roller Derby means another look at its unique rule set. Though these two organizations have a relatively small footprint in the derby community, they persist and remain in demand at some level. Their presence at RollerCon demonstrates that there is an audience for them, and that a number of skaters appreciate how there is something different out there. But there’s a problem. Many people only know WFTDA roller derby, so there’s a big knowledge deficit on how these other styles of the game really work. A decent number of people have seen non-WFTDA derby in action, but few have played it and even fewer truly understand the hows of the rules and the whys of the strategies that makes these derby variants compelling to skaters and fans. Thankfully, there is now a solution to this problem: We are proud to present the Flat Track/Banked Track Rules and Strategy Guide! Click the image to view and download the full PDF Guide! This three-page PDF is packed to the brim with everything you need to get up to speed with RDCL banked track and USARS flat track roller derby. Page 1 of the guide uses plain English to list off 20 major rules differences between the WFTDA, RDCL, and USARS. It includes game parameters and procedures, live gameplay, and penalty enforcement, in everything from the obvious (jam time) to the subtle (jam ending whistles). It doesn’t cover all the differences, but it’s more than enough to get you on your way. It sure beats combing through pages and pages of rules trying to figure it out on your own! Pages 2 and 3 of the guide go beyond the rule book with detailed explanations of key concepts in the RDCL and USARS, explaining how the rules affect team strategy during gameplay and why it differs from what you’d typically see in the WFTDA. The second page highlights the unique aspects of each rule set, and the third reveals the common strategies necessary for success in both of them. The guide is made with RollerCon 2015 in mind. Download it to your phone and refer to it in the convention center grandstands, during warm-ups before your banked track scrimmage, in the announcer booth, or in the comfort of your hotel room. It’s like an on-demand seminar in your pocket! Reading the rules, or even reading about the concepts behind the rules, may still not be enough for someone looking to fully understand how things translate to action on the track. That’s okay! We’ve got you covered there, too. 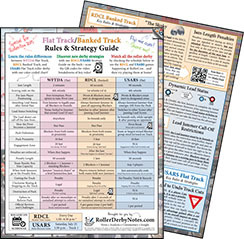 The Flat Track/Banked Rules and Strategy Guide also includes links to video breakdowns of the most important ideas that drive each style of the game. 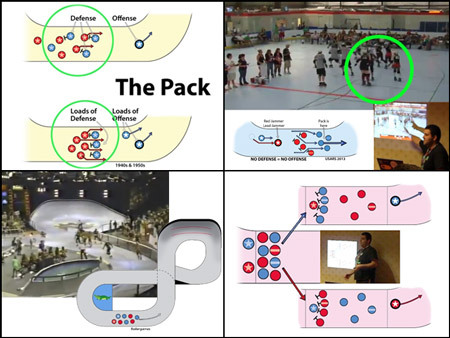 Whether it be of the RDCL “Slinky Pack,” the USARS Pivot Break, or how both the RDCL and USARS adhere to roller derby’s fundamental law of the fair and equal jam start, you can see it with live game examples, derby diagrams, and an expert explanation. Click on the special icon next to a rule the guide to go right to the video! A sample of what you will see and learn in our full 2013 RollerCon seminar. Click to view the whole thing on YouTube! All the video links in the guide will take you to a section of our highly-rated 2013 RollerCon seminar, Another Derby, which goes through 80 years of roller derby history in only 80 minutes. In addition to explaining modern derby rules differences, it also shows the similarities and connections to historic forms of the game. It’s the perfect companion to the PDF, and makes for great viewing during long car trips or flights. A must-watch for any true derby fan! Check out the full seminar on YouTube, here. But wait…there’s even more!? Woah, nelly! Roller Derby Notes will be at RollerCon in Las Vegas next week, and there’s nothing we like doing more than talking about roller derby. All the roller derby. That’s why we’ll be passing out a two-page version of the guide (while supplies last) at the banked track during most of the games there, and during the USARS Rules Showcase game on Track 1 on Saturday. The two-page RollerCon flyer. Get one. Or two! The front of the physical flyer is identical to the digital download, and the back has a condensed version of the strategy explanations. It may be smaller, but it’s just as insightful and informative. Even if you’ve already got the PDF version, the flyers and knowledge contained within are meant to be shared. Maybe you know a team with a banked track game coming up? Is your skating club brand-new to USARS roller derby? Are your league representatives wondering what to suggest as the next big rules innovation in the WFTDA? Hand them our guide, and they’ll get a big brain boost! If you’ll be at RollerCon, find us and say hello. We’ll also be able to answer any other questions about general rules differences or strategy considerations—in all forms of roller derby. Even the ones you haven’t heard of! We hope you find the Flat Track/Banked Rules and Strategy Guide useful, at RollerCon or wherever else it comes in handy. Download it now, and we’ll see you in Las Vegas! 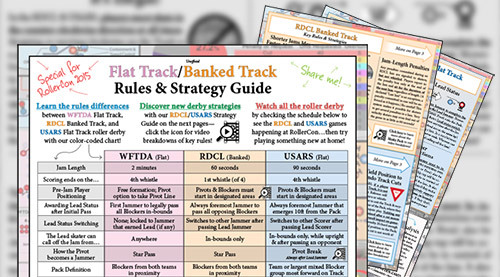 Disclaimer: Though the Flat Track/Banked Rules and Strategy Guide has been vetted by RDCL and USARS representatives, it is unofficial and not endorsed, sponsored by, or otherwise affiliated with any governing body. The information in the guide is deemed to be reliable as of the 2015 derby rules season, but not guaranteed. Roller Derby Notes is not responsible for any typographic errors. Sharing derby knowledge is cool. Keeping it to yourself is lame!